Wow! 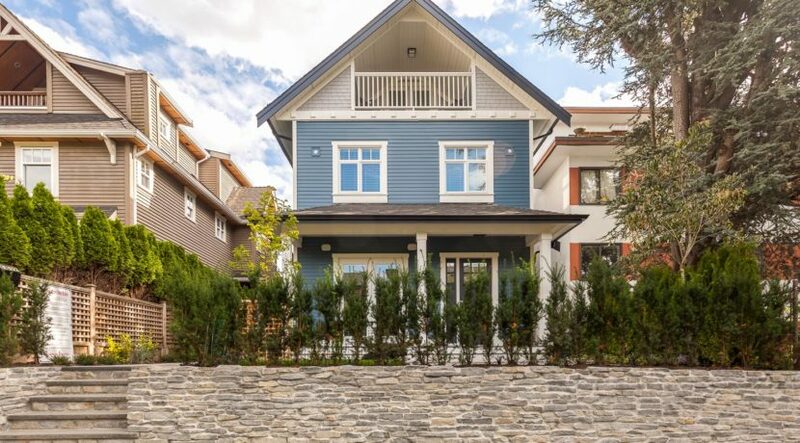 Stunning, brand new custom built 1/2 duplex in the heart of Commercial Drive! Built by Bricklane & exquisitely designed by Flow Home Staging, the attention to detail is obvious in this beautiful, functional home. The bright & spacious main has 10’ ceilings, wood floors & a perfect entertainer’s open plan. The gourmet kitchen hosts KitchenAid s/s appliances, quartz counters, island w/ breakfast bar & wine fridge. A very cool gas f/p feature highlights the living space where French doors lead to a lovely patio & grassy area. Up you will find the master with spa-like ensuite, 2 more bedrooms, full bath & laundry. Radiant in-floor heat, Grohe plumbing fixtures, designer lighting, skylights, crawl space, single garage…the list goes on. BONUS super rare sunny rooftop deck over the garage! PRIMARY: Lord Nelson School opened in 1911. Currently, Nelson has 388 students in 18 divisions with a diverse mixture of children from around the world. The school strives to accommodate all learning styles to encourage students to become assured, caring, responsible lifelong learners. Band, Hot lunch, Out of School Care and Strong Start parent participation programs offered on-site.Lord Nelson School opened in 1911. Currently, Nelson has 388 students in 18 divisions with a diverse mixture of children from around the world. The school strives to accommodate all learning styles to encourage students to become assured, caring, responsible lifelong learners. Band, Hot lunch, Out of School Care and Strong Start parent participation programs offered on-site. SECONDARY: Templeton High opened in the fall of 1927. It has won many awards for drama productions and for student films. Templeton is also known for its successful theatre and film programs, regarded as one of the best in British Columbia. Templeton is home to a Mini-School Program for gifted children, from grades 8-12. The objective of the Mini School is to foster interdisciplinary learning and environmental stewardship through interdisciplinary activities and field trips that bring the students together for a closer relationship with each other. Templeton has a stated goal of building knowledge, acceptance, empathy, and appreciation of Aboriginal peoples’ histories. The school has a Sacred Room, a welcoming and comfortable space for all students that celebrates Aboriginal traditions and cultures.